Now that you can book your travel using an iPod touch app for your airline or travel service, or just using the Safari browser to access their web services, you can also store the electronic boarding pass for a flight in the Passbook app. You can then use the Passbook app to display your boarding pass at the gate. If you collect store cards or coupons, you can also store them in your Passbook app and display their bar codes at the checkout counter. Passbook can store all the temporary passes and tickets you need while traveling and shopping, from loyalty cards, gift cards, and coupons to movie and sports tickets and boarding passes. Many of these electronic items include electronic bar codes, so you can use Passbook to display them in order to check in for a flight, get into a movie, or redeem a coupon. You can see when coupons expire, pinpoint where your concert seats are, or check the balance of a coffee loyalty card. If you’re close to a movie theater or store, the app uses location services to serve up a ticket or relevant coupon on the lock screen. To add these items (let’s call them all passes) to Passbook, you need to use apps or services that offer them. You also have to be signed into your iCloud account to add passes to Passbook. Passbook service in iCloud is on by default, so that passes are pushed to your other iOS devices that are signed in to your iCloud account. If you have turned off some iCloud services, including Passbook, you can turn them back on by choosing Settings→iCloud, and then tapping the Passbook On/Off switch to turn Passbook service on or off. Tap the Add to Passbook button on a merchant’s app, website, or confirmation e-mail message. For example, you can tap the Manage button for your cards in the Starbucks app to see the menu, and then tap Add Card to Passbook. The Passbook pass for the card appears on the screen, and you can tap Add to add it to Passbook (or Cancel). Launch Passbook, and the pass for the card appears along with other passes that appear as banners. You can see the banner for a Studio Botan pass from Deem Offers under the Starbucks pass. Tap a banner to view the pass. You can then point the bar code at the bar code reader or scanner at the checkout counter or boarding gate. You don’t have to launch Passbook to show your passes in some stores, theaters, and airports — if you turn on Location Services; your pass appears on the lock screen when you arrive at the store, theater, or boarding gate. You can then point the bar code at the bar code reader or scanner without unlocking your iPod touch. To prevent passes from appearing on your lock screen, choose Settings→General→Passcode Lock from the Home screen, tap the Turn Passcode On button and enter a passcode if a passcode is not already active, and tap the On switch for Passbook to turn it off. To view more information about the pass, change its settings, or delete it, tap the i (information) button in the lower-right corner of the pass. The information screen appears with any settings the pass offers (such as Automatic Updates for the Starbucks pass). To delete the pass, tap the trash icon in the upper-left corner. To view the pass again, tap Done in the upper-right corner. 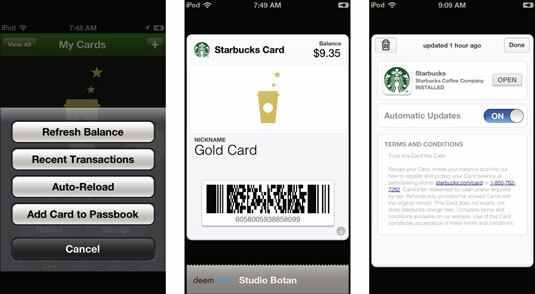 Passes associated with apps typically include an Open button on the information screen for opening the app — in this case, the Starbucks app.